What goes into the making of a card? In Tempest, we want every card to tell its own story. We want every game to be memorable. 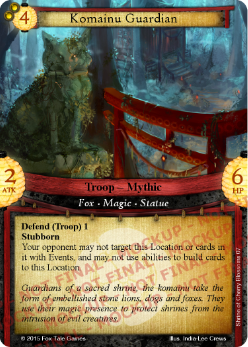 Today we look at what goes on in the design process of every card, using the Japanese Troop card Komainu Guardian as an example. A card begins as a basic design idea. When players build their decks in Tempest, they select a Deity and two Shards (a Temple and Battleground). Each of those comes with 15 cards that form a 45 card Research Deck for that player to buy from throughout the game. The base set of Tempest comes with the Shrine of Cherry Blossoms Temple Shard for the Japanese culture. (Further expansions will increase this number.) This Temple is based around protecting your Troops from your opponent’s Events and trickery. As such, the Komainu Guardian represents the traditional Japanese lion dogs that stand guard outside of shrines and temples. Note that in this early version, “Shard” cards were still called “Location” or “Zone” cards. From that concept, the basic card is formulated in an MS Word template, using simple algorithms to calculate things like Cost, Attack, Health, etc. Usually these will be wildly different to the final cards, as they will inevitably break the game in multiple ways or be entirely useless in practice. In this case, the card actually began as a Structure but was modified to be a Troop to improve its utility to players. The feel of the card (in this case, protection from evil) is then converted into abilities. The Defend keyword allows the Komainu Guardian to reassign damage from your other Troops, lending a little bit of protection to your armies. The Stubborn keyword was added to represent the immovability of the card – it can never retreat, even if you want it to. The keywords (eg “Fox”, “Magic” and “Statue”) are used for various reasons such as flavour, interaction with other abilities, or coding certain effects to certain keywords (eg all “Prophecy” cards grant bonus aether). Finally, Mythic type Troops in Tempest tend to have some unique ability. In this case, the Komainu Guardian prevents your opponent from playing Events in Shards where the Guardian stands vigilant. Once the card is designed, a simple “placeholder” image is drawn up in crayon so that our playtesters can easily tell the difference between each of the cards. This isn’t even close to final art (as you’ll see later) but it helps to give playtesters an idea of what the card actually is. As you can imagine, a lot of ancient names tend to be a bit lacking in Modern Day equivalents! These placeholder images will obviously be replaced in the final game! For the Kickstarter, we wanted to commission at least 20 pieces of art to showcase what the final game will look like. The final game will have closer to 110 pieces of art (which is where a lot of the Kickstarter funds are going). For the Komainu Guardian, we commissioned the talented India-Lee Crews, who can be found at www.indialeeart.com. The artist returns with a series of sketches, which we select from and provide feedback on, before the final image is rendered out. 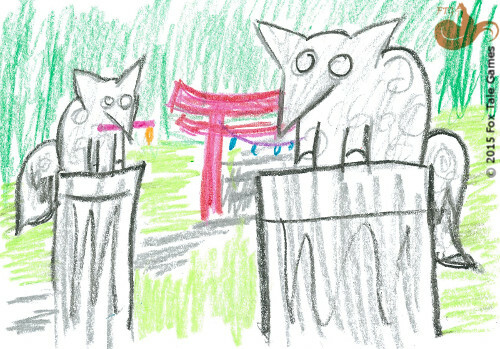 You can see a small selection of the sketches provided for the Komainu Guardian here. Feedback is given and the artist gets to work on illustrating the final artwork. Through the process, we get updates from our artists and make comments as we go, so that it is a bit of a collaborative process. In the case of the Komainu Guardian, India-Lee has put together a short speed-painting video showing her ongoing progress of the illustration. Once the image is completed, commented on, revised and finalised, the art is applied to the card template, containing the playtested card data. Small tweaks, cropping and colour balancing are applied to the card artwork to make it stand out in printing and against the template. Before the Kickstarter kicks off on 22 January 2016, the card will doubtlessly go through a number of revisions (both in art tweaking and card information), and the card template itself will go through its own revisions. But while the below isn’t illustrative of the final product, it should also give a fair indication of what the final card will look like! A long way removed from the Word template up above! So that’s that. We are in the process of commissioning artwork for at least 20 cards to demonstrate for the Kickstarter. Follow us on Facebook to find out more as the campaign moves towards our launch next year!